of upright ovoid form, raised on a flat circular foot and surmounted by a freely-modelled phoenix head with curled crest, large round eyes and hooked beak pierced to serve as the spout, the triple-stranded loop handle joined to the wide aperture at the back of the phoenix head by a rounded stud and the central ridge down the front of the vessel marked by a vertical row of small stamped rings to simulate the stitching or fastening on the seam of a leather canteen, decorated on one side with an incised figure of a seated lion and on the other side with three illegible Chinese characters, with stamped and applied medallions randomly distributed on both sides and clustered at the front, the heavy dark gray pottery with blackened surface unevenly burnished and with traces of burial earth. The specific form and elaborate decoration of this ewer appears to be unique, but pottery ewers of ‘phoenix-head’ design, based on Sasanian prototypes, were a popular type of luxury vessel in China in the Tang dynasty. 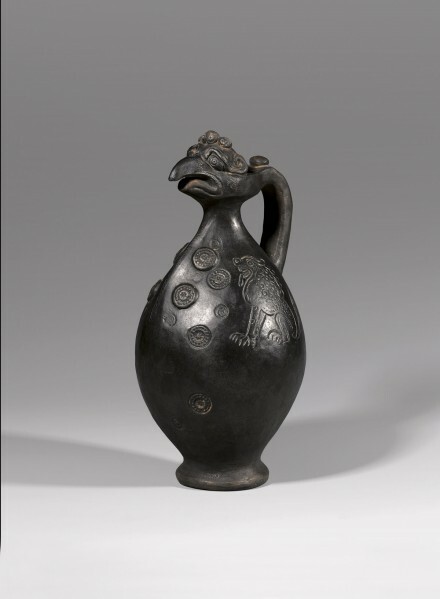 A Tang white-glazed stoneware ‘phoenix-head’ ewer of related type in the collection of the Tokyo National Museum is illustrated in the catalogue of the exhibition entitled Cultural Crossings—Tang Art and the Japanese Envoys, Tokyo, 2005, p. 82, no. 47 together with a glazed white pottery ewer of similar form but with simple lobed mouth, p. 83, no. 48, from the Gotoh Museum, and a large and very elaborate sancai-glazed pottery phoenix-head ewer of related form, p. 117, no. 80, from the Hakutsuru Museum. Compare also the sancai-glazed pottery ‘phoenix-head’ ewer of the more common type, moulded with designs derived from Sasanian metalwork, included in the traveling exhibition organized by the Cultural Bureau of Shaanxi Province and shown at the Hong Kong Museum of Art and illustrated in the catalogue, Treasures from Chang’an: Capital of the Silk Road, Hong Kong, 1993, no. 30.